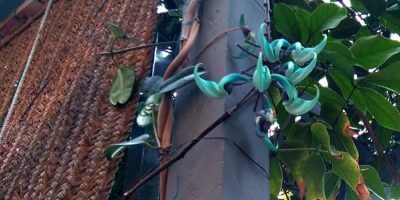 The jade vine or emerald vine Strongylodon macrobotrys, is flowering in the garden at Hacienda de Abajo, Tazacorte. The plant comes from the Philippines, and it’s in the same family as peas and beans. To be picky, I’d say it’s more turquoise than green but it’s certainly very pretty and I’ve never seen one before.